Only in the land of the Vikings would anyone throw rocks at people in order to heal them. 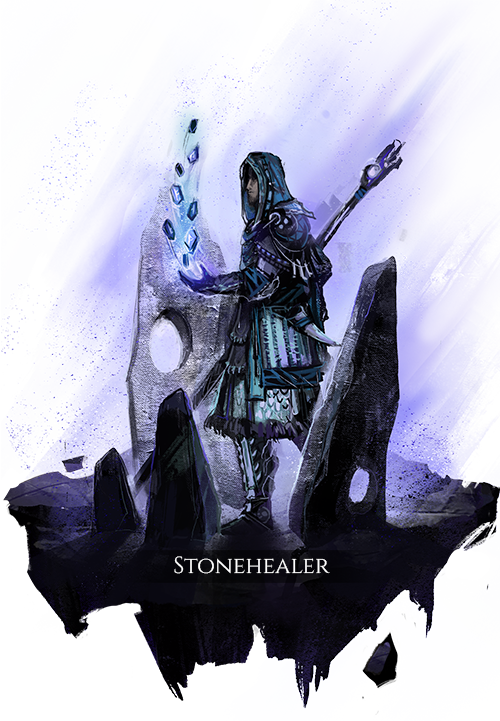 While it is unfair that some claim Stonehealers are men and women who have fallen on their heads too often, it is true that being a Stonehealer does come with certain unique risks to the healers themselves. They are certainly among the most stubborn, thick-skulled defenders of the Realm! Provides an aura to nearby group members that delivers a low amount of healing over time, and acts as an anchor point for targeted heal over time effects. Only one stone of this type may be deployed at a time. Throws a stone a short distance in a direction or toward a friendly target. An ally struck by the stone gains the stone’s effect. If within range, effects of this ability originate from the stone that uses the same type of the primary component of this ability, rather than originating from the user. Pick up a nearby deployed stone of the desired type to gain its effect and recover an amount of blood based on its remaining power. Encases the user in stone, providing an earth buff that adds disruption health to abilities, and provides a barrier with high damage mitigation for a moderate duration. If outside, a large stone is dropped from the sky on the position of the user’s killer, causing high damage to enemies it strikes and greatly extending the effects of all remaining stones in range.